West Linn City Hall is located at 22500 Salamo Road, West Linn, OR 97068; phone: 503-657-0331. Photo: Lewthwaite-Moffatt House, ca. 1896, 4891 Willamette Falls Drive, West Linn, OR. The Historic District was listed on the National Register of Historic Places in 1994. Photographed by User:Ian Poellet (own work), 2013, [cc-by-3.0 (creativecommons.org/licenses/by/3.0)], via Wikimedia Commons, accessed April, 2014. In 1840, Robert Moore came to Oregon from Illinois and purchased 1,000 acres lying along the west bank of the Willamette River at the Falls. This land, which had been an important site for Native Americans for 2,000 years, was purchased from Chief Wanaxha of the Wallamut Indians. Moore platted a townsite in 1843 of 25 blocks and named it "Robin's Nest" after his cabin, which stood on a slope overlooking Willamette Falls. By an act of the Provisional Legislature on December 22, 1845, Moore changed the name of the town to "Linn City" in honor of his friend, Dr. Lewis F. Linn of Missouri. Later, the town was known as West Oregon City. To ensure a safe water supply, this area, along with Bolton, Sunset, and Willamette, was incorporated in May 1913. After a naming contest, the community was incorporated as the City of West Linn on August 15, 1913. A number of historic areas and sites exist in West Linn. The Willamette Falls Locks, built between 1868 and 1873, is on the National Register of Historic Places. The McLean House, built in the 1920s and located at 5330 River Street, continues to be a favorite wedding venue and meeting place for local civic groups. 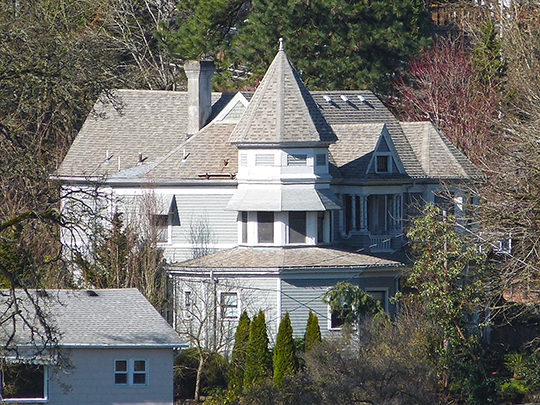 The Willamette area encompasses the early subdivision platted for Linn City, including several structures built in the late 1880s and early 1900s. Historically, the Willamette River and Willamette Falls played a significant role in the prehistoric settlement of the area that is now West Linn. This was a main fishing and trading area and three archaeologically significant sites have been identified to date. The Wallamut and Kalapuya were two Native American tribes known to have been active in this area. City of West Linn Comprehensive Plan, 2008, www.westlinnoregon.gov, accessed April, 2014.